Synopsis. (Goodreads) I was bred to be the perfect pet. I was bred for my beauty and grace, to be a showpiece, an ornament to sit upon the couch, to sing, to dance, to play the piano and paint. I was bred to willingly put my owner's happiness before my own. Until Penn. The handsome and rebellious son of the congressman who owns me, he's the only person who's seen past my perfect exterior to the girl underneath. Falling for him is forbidden. Falling for him is freeing. But there's a dark underworld lurking beneath my pampered life. The only thing more dangerous than staying with Penn's family is escaping it, because if I fail, I face a fate far worse than death... For fans of Kiera Cass's Selection series and Lauren DeStefano's Chemical Garden series, Perfected is a chilling look at what it means to be human, as well as a stunning celebration of the power of love to set us free, wrapped in a glamorous—and dangerous—bow. Perfected is a book that intrigued me from the onset, with its beautiful cover and the subject matter I was eager to start on it as soon as it hit my kindle. Ella has been trained from birth to be a beautiful showpiece and the perfect demure and graceful little pet (which is really what they are called) for the rich, elite and powerful. Purchased by the congressman who passed the bill, she is pampered and has everything she could wish for right at her fingertips – except for the one thing she truly yearns for, her own happiness. Perfected for me was unfortunately imperfect, it was entertaining but I did have a few issues; the main being that Ella was more or less a family pet, right down to references about having to walk on a leash, coming from a kennel, being spayed and micro-chipped – she was more or less a human version of a dog, ethically and morally for me, it was wrong on so many levels and I struggled to get past this aspect to see her as more of a person rather than a centerpiece for this family. Ella was another of my gripes, yes she was likable but she was so naïve, too trusting and came across as weak; this was of course because of her training and upbringing but it didn’t make her a stand-out character, she lacked oomph. Along Ella’s journey she was discovering the truth not only about herself but also about what she had been taught her whole life - perfection comes at a price; there is a bit of a mystery in the plot with the family’s previous pet and I was waiting for a more explosive reveal but the outcome was a little too simplistic and it was brushed over. The romance is an aspect I did enjoy despite the beginning being a bit odd and it being rushed – Penn couldn’t stand Ella on sight, the next moment he is constantly near and wanting to introduce her to new experiences; their interactions were quite sweet, also timid; everything for Ella was all so new so the smallest things Penn would introduce her to from swimming to banana splits bought out new emotions and experiences for her which had previously been lacking. I enjoyed most of the secondary characters, Ruby was fabulous and Penn was a sweetheart and saw Ella for who she really was; the touchy feely parts with the congressman made me squirm – I didn’t trust his affections and Claire’s hatred left me baffled. The interactions were all done well. Overall, Perfected was written well but lacked the wow factor for me and unfortunately I couldn’t get past the fact humans were being genetically altered to be perfect in every way; the concept was odd. 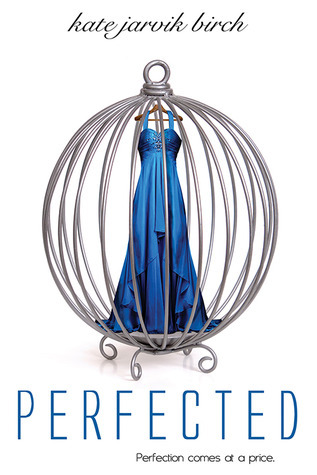 Thank you to Entangled Teen for the opportunity to read and review Perfected. About the author: Kate has loved writing ever since she was a little girl. She wrote her first novel in fourth grade (the main character was suspiciously similar to herself). As an adult, her essays and short stories have been published in Isotope: A Journal of Literary Nature and Science Writing, Saint Ann's Review, Scissors and Spackle and in a forthcoming issue of Indiana Review. Her first play, (a man enters), co-written with Elaine Jarvik, was produced in 2011 by Salt Lake Acting Co. I don't think I've heard of Perfected before, but you're right it does sound intriguing and does have a great cover. Thanks for reviewing it, I may still check it out sometime in the future. Wow, Sharon. I think I'd have an easier time with genetically altered-to-be-perfect humans than humans treated as pets. Ugh. Thanks for the heads-up on this one. I had been considering it, but . . . yeah, I don't think so. I didn't take this one for review. I'm kind of glad now. Thanks for sharing.